Fifty years after its initial release, The Beatles' self-titled album remains their most sprawling work -- an album that saw John Lennon, Paul McCartney, George Harrison and Ringo Starr working to follow their most acclaimed album with something that went in an entirely different direction. The year 1968 was raging, with the ongoing Vietnam War, assassinations of Martin Luther King, Jr and Robert Kennedy, and a music scene that was breaking new ground as hard rock and freewheeling funk began taking over the airwaves. Bob Dylan re-embraced rustics, Otis Redding had passed away, Motown got psychedelic as the Rolling Stones got back to the blues; Hendrix turned rock music on its ear as Aretha Franklin became the voice of a generation. But what of The Beatles? The Fab Four spent early 1968 studying transcendental meditation in India with the Mahareshi Mahesh Yogi, a period that was intended to be cathartic, but eventually led to conflict within the band when McCartney and Starr returned to the U.K. early and exacerbated after Lennon became publicly disillusioned with the Mahareshi. But when it came time to record their follow-up to the mythic Sgt. Pepper's Lonely Hearts Club Band -- the innovative 1967 blockbuster that quickly became the group's most successful and praised LP -- The Beatles broke ground a project that was wholly removed from that album's art-pop pretenses and ornate production. The Beatles -- familiarly dubbed "The White Album" after its mostly blank cover -- represented the Fabs returning to band-centric recording, though there's still some orchestrated moments on the album. It also presented the most individualistic musical approach among the increasingly isolated members of the quartet; it was famously described by Lennon as the work of four solo artists using the others as backing musicians. It has always been a gargantuan work, a 30-track double LP representative of both the creative scope of The Beatles and their penchant for indulgence late in their career together. It's a study in contrasts; the set boasts many of their most indelible acoustic tunes ("Blackbird," "Dear Prudence") and also several of their hardest rockers ("While My Guitar Gently Weeps," "Helter Skelter.") The former was born of the songs gestating in Rishikesh, where the Beatles had only brought acoustic guitars; the latter evidence that the hard rock revolution born of Hendrix and Cream had an affect on the Fabs' own sound when they returned to London in the late spring of 1968. The White Album has traditionally been regarded as the album that reflects the band at its most fractious and fragmented; Ringo Starr famously quit during the sessions, and Lennon, McCartney and Harrison often recorded tracks on their own in separate studios. But the actual history of the project is a little more complex: as relations within the band surely became more strained, there was still a deliberate effort to return to playing as an actual band following the lush arrangements and endless overdubbing of Sgt. Pepper. That particular aspect of The White Album and its history amplifies what turns out to be the most intriguing element of the new deluxe anniversary reissue -- out Friday (Nov. 9, 2018) -- which are the fabled Esher demos, and the "Sessions" disc that give fans a glimpse of what the recording process was like. The remixed album isn't quite the revelation that the deluxe version of Sgt. Pepper's Lonely Hearts Club Band was last year -- but that's to be expected. Pepper was a heavily orchestrated album that producer Martin admitted suffered from mediocre conversion to stereo; by the time they got to The White Album, The Beatles were much more adept at studio recording. That's not to say there aren't sonic high points -- the bass and drums are much more powerful and warm on tracks like "Glass Onion" and "Gently Weeps," and the vocal mix is stronger on the lilting harmonies of "Dear Prudence." Lennon's abrasive "Yer Blues" vocal is laden with more reverb here but loses none of its immediacy; and Harrison's "Savoy Truffle' has a more prominent low end, amplifying the overall heaviness of the record. It's noticeable, non-intrusive work, and Giles Martin deserves praise for how beautifully rendered the remixes are. The "Sessions" disc also offers some eye-opening takes on well-worn Beatles standards from the album. Ringo's saccharine Lennon-penned closer "Good Night" boasts flawed-but-sweet backing harmonies that serve the song better than the original's Disney-esque strings. A "First Version" of the roaring "Helter Skelter" feels more ominous than its official counterpart, with a thumping intro and 12 minutes of the Beatles lurching through a dark blues groove. There are early takes of unused Harrison songs that would turn up in different places later: "Sour Milk Sea" would find release as a Jackie Lomax single produced by Harrison, "Not Guilty" and "Circles" became solo Harrison songs in the 70s and 80s, respectively. And then there's Lennon's fabled "Child of Nature," the early version of what would become his classic ballad "Jealous Guy." Initially an ode to the group's sojourn to India, the version here highlights how fully formed the song was melodically at this early stage -- despite completely different lyrics from what the world would ultimately hear upon its official release in 1971. There's also the full version of McCartney's simple acoustic "Can You Take Me Back?," the snippet that appears on The White Album as a coda for Lennon's "Cry Baby Cry." An intimate run-through of "Julia" conveys the emotion Lennon felt while struggling to record the plaintive ode to his late mother (and new love, Yoko Ono), as John mutters, "It's very hard to sing this, y'know?" -- to which producer George Martin can be heard responding: "It's a very hard song, John." There are also loose takes of songs like "Blue Moon," "St. Louis Blues" and "You're So Square (Baby I Don't Care)." But the biggest highlight is arguably the Esher demos. Fans have only heard these performances via poorly-recorded bootlegs that have made the rounds for decades, but here, Giles Martin delivers full recordings from George Harrison's vault. The sound is very much "Beatles: Unplugged," with Harrison, McCartney and Lennon demoing the songs they'd penned in India for each other. It's a fascinating look at just how creatively fertile the three songwriters were following that episode, and it's intriguing to hear the songs in their earliest incarnations without full band backing. McCartney's "Back In the U.S.S.R." demo evokes the song's Chuck Berry soul in a more obvious fashion than the official recording. The acoustic Esher demo of "Yer Blues" is a more traditional blues excursion than the abrasive parody that wound up on the album; the demo of eventual Abbey Road medley pit stop "Polythene Pam" maintains the song's inherent energy, but also makes it apparent how much the full band arrangement elevated Lennon's ditty. Elsewhere, "What's The New Mary Jane?" has lurked on bootlegs and the Anthology project, but still sounds like a tossed-off nonsense song here. The remixed White Album is well worth experiencing -- for Beatles fans, it's a chance to hear the band's most sprawling work in the varying stages before it became fully formed. It's an important document of where they were just before things fell completely apart, and reveals just how musically in-sync they somehow remained even after the splinters began to show. For casual fans, it may not be as revelatory, but it's nonetheless musically rich. The refurbished sonics maybe won't get your attention if you're not intimately familiar with the album already, but they may help one "hear" The Beatles circa 1968 in a visceral, immediate way. The Esher demos and Sessions recordings offer a broad palette of sounds that show how, even without studio wizardry and the creative indulgences of the times, The Beatles were both accomplished songwriters and a very tight little foursome. In 2017, the Beatles paid voluminous tribute to their Sgt. Pepper's Lonely Hearts Club Band for its 50th anniversary with a multi-disc box set that featured a new remix of the album and multiple discs of outtakes. The set was a huge success and put the album back on the Billboard charts. On Nov. 9, the Beatles are doing that same sort of tribute to the album originally released as The Beatles but commonly called The White Album. As Pepper was, the new set is being released in several configurations, the biggest being a seven-disc set with 6 CDs and a Blu-ray audio disc. The main feature of the new release is a 2018 mix of the album. On the big "Super Deluxe" set, that mix is on two CDs and the set also includes four CDs of outtakes and alternate versions and a Blu-ray with three versions of the 2018 mix in album mix in 5.1 sound in high resolution PCM stereo, DTS-HD Master Audio and Dolby True HD. Music journalist Brian Southall, the author of a just-published book in the U.K., The White Album: Revolution, Politics & Recording: The Beatles and the World in 1968 (Carlton Publishing Group), told Billboard the year was a time of change for the Beatles. "The Beatles at this time are now fully grown up adults. They're not The Fab Four anymore. And they went off to India with that sort of love and peace in the Maharishi to find something over there and as it turned out, found themselves fairly bored without any substances, legal or illegal, alcohol or tobacco or anything else. And ended up sort of writing a whole album." Writers have long called the White Album the beginnings of the Beatles as solo artists. Says Southall, "The idea that everything was worked as a Lennon-McCartney song we know to be completely untrue and many of them were individual songs which other people contributed to or in some cases contributed nothing to. So I think there was undoubtedly some group involvement in this stuff in various tracks. But from talking to people who were in the studio and working on this stuff, you know, it was unquestionable, no doubt that these some of these people went off and did what they wanted to do on their own." Producer Giles Martin told Billboard, however, the group was very unified. He noted Ringo Starr actually first suggested publicly when the Sgt. Pepper box set was being put together last year that they should do The Beatles (White Album) in the same way. "Because that's the band album," Martin said. "That's the band album. And this is the person that walked out of those sessions." Here are some signposts for things to listen to on the new White Album release. While the 2018 mix may not have as many obvious changes as the 2017 Pepper mix, there are a few things to look for. Overall, the instruments stand out better in this new mix than previously. A great example of this is "Dear Prudence," where the guitar and bass work pops out of the speakers. The listener can also appreciate the intricacies of the musicianship as they now stand out in the new mix more. And the rockin' tracks, such as "Back in the U.S.S.R." and "Birthday" really show, if nothing else, these guys could rock 'n' roll. The correct pronunciation is ee-sher, supervising producer Giles Martin told a group made up of media, music and entertainment folks at the Capitol Records tower in Los Angeles in late September. The 27 tracks, taken from a tape provided by George Harrison's widow Olivia, were recorded at George Harrison's Esher cottage before the album itself was recorded and show several differences from the released versions. The Esher Demos have circulated among collectors for years, but not in this true stereo and brilliant quality. But Giles Martin told Billboard in an interview that he left some of the roughness of the original tapes in. "I can't take away the hiss because it takes away the sound slightly. We cleaned them to certain degree, but it's because of mix and EQ. It's just what we do, really." On the songs, the group is often loose. George Harrison's "Piggies" strums and whistles casually and has fun by emphasizing the words "damn good whacking." Paul McCartney takes the casualness further on "Honey Pie" by la-la-la'ing through several lines of the lyrics. The tracks also have several songs that never made the album, including Harrison's "Not Guilty" (a comment on the then-splintering state of the group), Lennon's esoteric "What's the New Mary Jane," McCartney's "Junk," which later was included on his McCartney album, and another Lennon song, "Child of Nature," which later, with different lyrics, became "Jealous Guy" on his Imagine album. A few of the outtake tracks on the Super Deluxe version of the set give excellent looks at the evolution of some of the album's songs. The ten-minute "Revolution 1" outtake that opens Disc 4, the first disc of the "Sessions" section, shows first-hand the song's direct relationship between "Revolution #1" and "Revolution #9." The song starts out like the "Revolution #1" released version but turns into a "#9" type sound collage. This was first evident a few years ago when a different pre-release take of the song emerged among bootleg collectors, but this one features Lennon yelling into the microphone and includes Yoko's plaintive "They become naked" line. 4. "While My Guitar Gently Weeps"
Anyone who has heard the version in the Beatles' LOVE show in Las Vegas (minus the orchestral arrangement added for the show) has already heard a gorgeous version that didn't make the album. The outtake at the end of Disc 5 shows an unfinished version with a different and burning Eric Clapton guitar solo. It's followed by a short Paul McCartney riff on Elvis Presley's "You're So Square (Baby I Don't Care)" with McCartney in full-blown Elvis mode, complete with echo. Before the track lists for the sets were announced, Beatles fans held out hope that the legendary 27-minute version of this song would be released. It wasn't, but there are two outtakes on the set. The first, Take 2, is 13 minutes long and was recorded just before the famed long take. It resembles that fabled longer version Giles Martin told those at the Capitol Tower listening session and is slower than the released version. Take 17, actually the more listenable of the two, is closer to the released version and is a wild take with McCartney screaming his way through it. If the originally released version seems raucous, Take 17 outdoes that. Martin told Billboard with projects like the Pepper and White Album sets the emotions of the fans are being heard. "The passion that people have for the Beatles, you know, it's something, you know. When my dad was on his deathbed, which he spent a long time on them, and my dad was such a nice man. And I said to him, 'I really want to say this.' I said, 'You know dad, it's amazing what you did?' And he goes, 'What do you mean?' 'Above anything else if you think about it,' and as a son you don't want to say this because it's a bit fan-y. But I'm not a fan, I'm his son. "But the reverberations of that, of him and the band came together and performing and creating this world of this universe of sound there's made so much difference to everyone else. And that love that comes back towards the Beatles and us that work on the Beatles projects we can't take that for granted. We have to listen to the fans. And so we try to." Hard-core fans of The Beatles like to pore over every detail of the band and endlessly dissect their songs. Then there's Giles Martin, who manages to time-travel to meet the Fab Four. "It's really nerve-racking because it's a legacy of music which is really important," the soft-spoken Martin said. "What I do is make sure I provide the fans -- and people who don't even know the Beatles -- with music that's worth listening to and is interesting." Martin last year remixed Sgt. Pepper's Lonely Hearts Club Band and this year resurfaces with a fascinating and exhaustive look at The Beatles, better known as the "White Album," which contains such classics as "Back in the U.S.S.R.," "Blackbird" and "Ob-La-Di, Ob-La-Da." It coincides with celebrations for the album's 50th birthday. Besides punchier, remixed versions of the 30 songs on the original double album, the anniversary package includes 27 acoustic demos of material the Beatles made at Harrison's house before going into the studio and 50 studio outtakes, including the unreleased "Not Guilty," a studio jam of "Blue Moon" and early versions of "Let It Be," "Lady Madonna" and "Across the Universe," which would appear on other albums. Martin couldn't help using a Beatles reference to explain what his goals are:"I'm sort of trying to peel back the layers -- the glass onion, if you like. I peel back the layers so you get to hear what I can hear at Abbey Road. 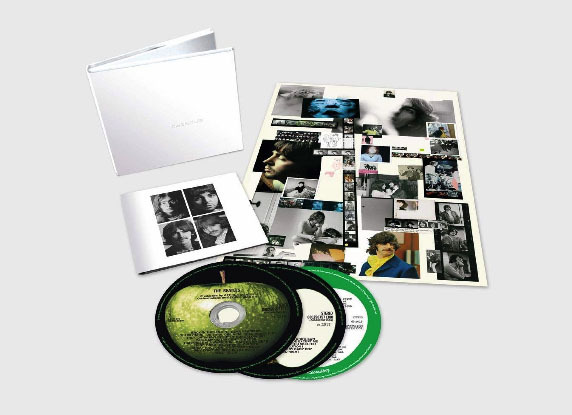 Among the gems in the box set is an unrecorded Lennon song called "Child of Nature" that will later morph into his solo hit "Jealous Guy" and also a very cool"Good Night" stripped of the orchestrations it got on the "White Album." You can hear "Happiness Is a Warm Gun" start out life as quite gentle before ending up on the "White Album" like a template for Frank Zappa. "I think the most revealing thing for me working on the 'White Album' is just how creative they were, all of the time," said Martin. "It's almost like the studio couldn't handle the level of demand that they wanted to do and the amount of songs they wanted to record." Martin's father was heavily involved in the Beatles' prior album, Sgt. Pepper's Lonely Hearts Club Band, and was even lauded as the architect of their sound. But the Fab Four came together for the recording of the "White Album" in the summer of 1968 with a different goal in mind. "They didn't want an architect. They wanted to build an album from the bricks up and without any real idea about what it was going to be, said Martin. "They indulged themselves because they knew that each member of the band would make the song better." William Moylan, a professor of music and sound recording technology at the University of Massachusetts at Lowell, said the recording of the "White Album" found the members of the Beatles at a crossroads. "It's really where the Beatles are exploring their own individuality and they're still working off the collective. They're coming out of Sgt. Pepper's and they're coming out of Magical Mystery Tour and they're coming out of the psychedelia," Moylan said. "They're branching out, into popular music, into musical theater, back to rock, even Tin Pan Alley-type pieces." The accepted wisdom when it comes to the "White Album" is that it was a rocky time for the band, which was disintegrating. Starr quit and walked out for an 11-day period. Critics have called the record a mess -- a brilliant mess, of course -- with each member often delivering solo songs. "The revealing thing for me is you go back and listen to the tapes and what we have on the tapes is a cohesive unit playing together and working on songs together," says Martin, who was born a year after the "White Album" was released. "Listen to the sessions -- they were very warm. And that's the surprising thing. I think we thought the 'White Album' was this disparate, angry record -- and it has certainly elements of that -- but, in essence, the four of them made an album together they wanted to make." That sounds about right said Moylan, who has been a record producer, engineer, composer and teacher for 25 years: "I've really always had a sense that the Beatles were professional musicians as well as being friends. When they were performing, any personal friction evaporated because it was all about the music."